Groziethen (2), Brandenburg, Germany. Reported 7th July. A 損inwheel� which was drawn in crops near Groziethen, Berlin on July 7, 2015 asks us to rotate a landscape number �� to the left by 90o. Once we do so, then we find a complete Mayan calendar date of 0.2.10.6 for July 7. Just above that Mayan calendar date, we can see in the landscape a 揵ird� and 搒erpent king�, who are looking down on a 揟rojan Horse�. Just below we could see the landscape shape of a 45o-45o-90o right-angle triangle (outlined in brown). 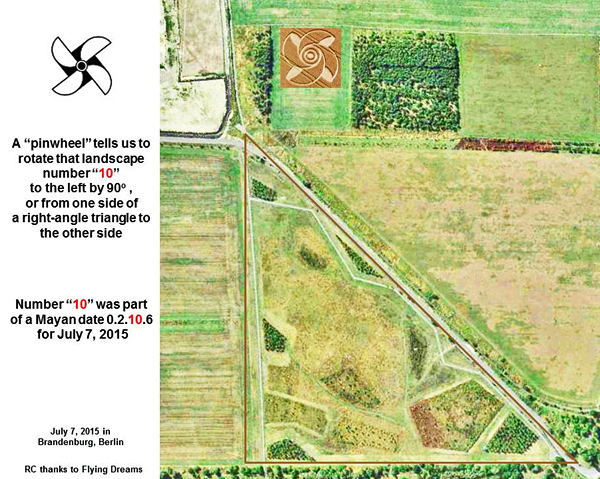 A puzzle drawn in crops: what is that 搑otating pinwheel� trying to tell us? This 揷rop puzzle� is essentially asking us to rotate those two landscape numbers of �b>1� and �b>0� to the left by 90o, or equivalently from being parallel with the bottom side of that right-angle triangle, to being parallel with its upper left-hand side. 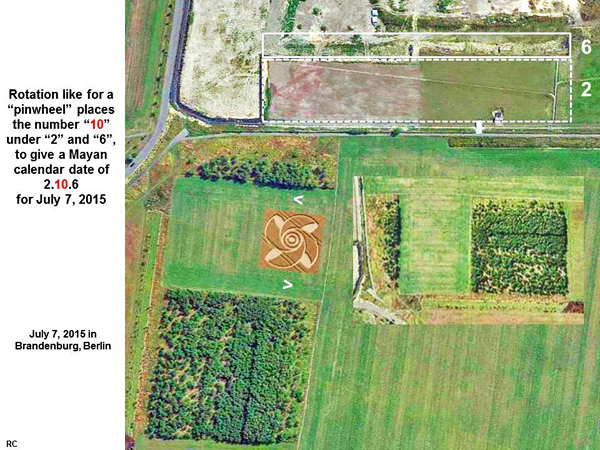 A combined number of �b>10�, which might be created by placing both landscape numbers of �b>1� and �b>0� together, was part of the Mayan Long Count calendar date 0.2.10.6 for July 7, 2015 (see www.pauahtun.org). These two sets of landscape 搑ectangles� are located just above the number �in �b>10�. They now provide a full Mayan calendar date of 0.2.10.6 for July 7, 2015. Please use Google Earth to study other interesting features at latitude 52.415o North, longitude 13.460o East, if you wish to see more details? The order of calendar numbers going up is �b>10� then �b>2� then �b>6�, once we rotate the lowest and largest) number �b>10� to the left, like for a 搒pinning pinwheel�. The default image shown on Google Earth for this latitude and longitude comes from the year 2012, and is out-of-date. 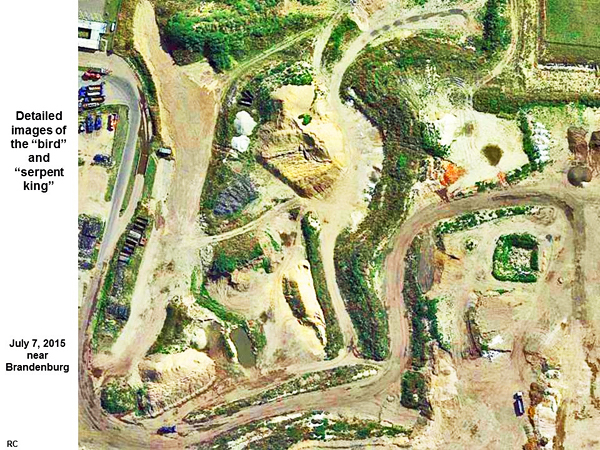 Please use a 揌istorical Imagery� feature of Google Earth to see the most recent satellite images from September of 2014. Just above that landscape row of �b>6� rectangles, we can see a small 搒erpent� shape, which appears to be 搇ooking down� at various features below. In Mayan times, numbers such as �b>2�, �b>6� and �b>10� were called 搒erpent numbers�, when they formed part of the Long Count calendar (see www.mayainfo.org). 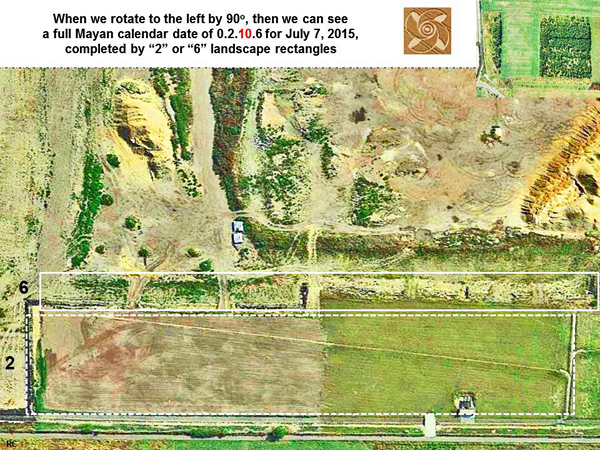 Why so much fuss over a Mayan calendar date of 0.2.10.6 for July 7, 2015? Why did the crop artists draw a 損inwheel� in that particular location, to tell us the current date in calendar system other than our own? It seems to be because of something else important, which they had drawn in the landscape just above. When we use Google Earth to look just above those two sets of 搑ectangles� in the landscape, near latitude 52.411o North and longitude 13.461o East, while selecting for 揌istorical Imagery� to see the most recent photographs from September 2014, we find something very interesting! One of those two 損eople� seems to be 搒tanding on a ladder�, in order to look out through a 搒quare window�, just like for the famous Trojan Horse of ancient legend (see pantherfile.uwm.edu or web-facstaff.sas.upenn.edu). We were just warned about a modern 揟rojan Horse�, which will be given soon to humans on Earth by unfriendly extra-terrestrials, at Torino Airport in Italy on June 23, 2015 (see comments or articles). That amazing crop picture said �i>timeo ET ferentes!�/i> in computer ASCII code. 揃eware of extra-terrestrials bearing gifts!� The new crop picture in Berlin on July 7 clearly shows a 揟rojan Horse� in the landscape nearby. This cannot plausibly be a 揻ortunate accident�. If some message of warning comes repeatedly from friendly extra-terrestrials, in the form of spectacular crop pictures, saying how we should 揵eware of grey aliens who come bearing gifts�, how much easier is it for the average person to block it all out, or to imagine that none of this really happened? Again in psychology, this is called 揷ognitive dissonance�. Thus in order to believe that some modern crop pictures are really made by friendly extra-terrestrials, even if that conclusion is well-evidenced, they would have to believe that some of their 搕rusted authorities� have been lying to them for many years. Some people have said to me, 揟he financial default of Greece might be our new 慣rojan Horse�! Are you sure that the binary code at Torino does not say 慐U� instead of 慐T�� That is a funny joke, and you can believe it if you wish. Yet the Torino crop picture (and this new one) seem to warn us about unfriendly extra-terrestrials, not the European Union. Why would the 損inwheel� crop picture tell us to look 搖p and to the left�, if there were nothing important there to be found? 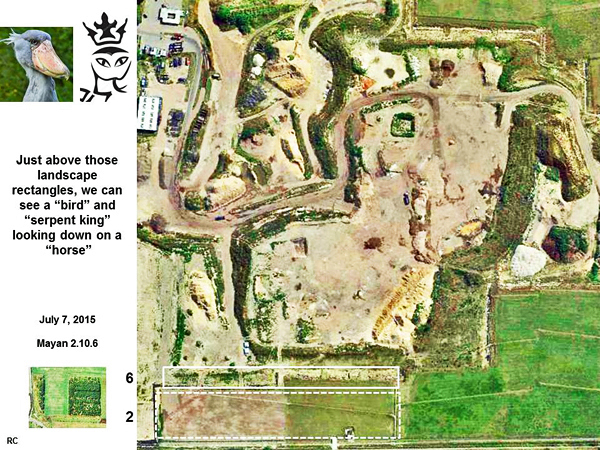 These observations lead us to believe that friendly extra-terrestrials may have 損atterned� those particular landscape features of a 揵ird�, 搒erpent king� and 揾orse� in September of 2014, to prepare for their 損inwheel� crop picture 10 months later in July of 2015. In fact, the landscape location where they drew their 損inwheel� said �b>10�. Landscape patterning by extra-terrestrials is not uncommon in the study of modern crop pictures. There are other well-known cases (see for example fringe2014a). Of course, no local human could have created such landscape patterning using 搑ope and boards�, so few people wish to believe that it might be true! 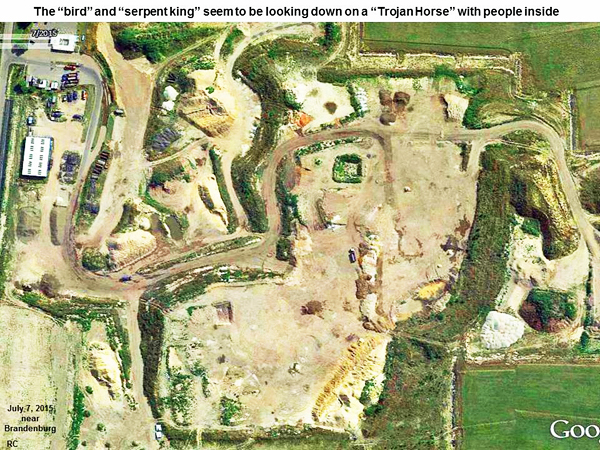 We do not know, in any of these examples, how such patterned changes in the appearance of nearby landscapes really occurred (see also Jesuss-face-seen-in-Google-Earth-image). Two other details of a patterned landscape near that 損inwheel� crop picture seem to be: (1) a 搈an with a cap�, perhaps Japanese, looking at a 揹ead dolphin� (see slides above), and (2) off to the right (not shown), the image of an 揺arly-stage human fetus�. All three images of a (i) modern 揟rojan Horse�, (ii) the unnecessary killing of dolphins and whales, and (iii) the abortion of early-stage human embryos, may be current human behaviours of which those friendly extra-terrestrials do not approve. This new 損inwheel� crop picture near Berlin on July 7, 2015 seems to confirm their earlier warning about a modern 揟rojan Horse�, which was drawn in crops at Torino Airport on June 23, 2015. So we can probably expect a real 揟rojan Horse� attack of some kind, from unfriendly (grey) extra-terrestrials in the near future. Yet who might be giving us such helpful messages of warning? Who are the 揻riendly� extra-terrestrials? Given its Mayan calendar date of 0.2.10.6, along with a notable 揵ird� symbolism, this 損inwheel� crop picture suggests that one of those two gentlemen might be the prolific crop artist 換uetzalcoatl�. His kingly 揾eaddress� was drawn in crops in 2009 (see time2010f or www.youtube.com). 揧ou are a king then!�/span> replied Pilate. It is becoming increasingly difficult not to believe, that modern crop pictures are 搒igns on the Earth�, which were prophesized to happen before the return of Christ and his colleagues from the stars (or perhaps from a parallel universe). The Biblical symbolism of a 搑ider on a white horse� also fits in with many crop pictures which have been drawn in Wiltshire, that point toward 搘hite horses� on the hills nearby. How disappointing that this great truth has not been made known to the British people! Instead, they are told in newspapers and on TV (see for example www.youtube.com) that all crop circles are made by 損ranksters using rope and boards�, the best of whom are called 揟eam Satan�. A 搇abyrinth� crop picture which appeared at Sunnyside on June 22, 2015 also showed Christian symbolism (see sunnyside articles). During the summer of 2010, a spectacular two-part 揻ace of Jesus� crop circle appeared near Wickham Green (see www.youtube.com). Still the British and other European people have not absorbed such important and uplifting facts.